8 pages. Volume 4, Number 24, dated January 1, 1979. Newsletter / bulletin originally mailed-out to amusement game operators, providing updated info about the coin-op industry. A great historic insight to the industry of the time. 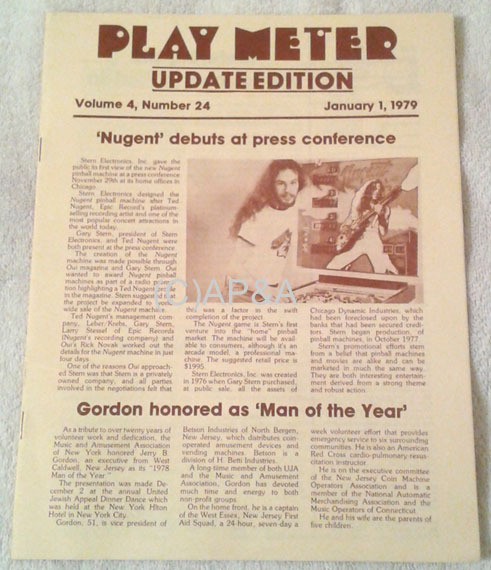 This edition includes information about Stern Nugent pinball debuting at a press conference by Stern in Chicago (picture of Ted Nugent with the pinball on front cover), juke box updates, tech info and tips, classified ads, and for juke box operators- a listing of the top 75 record/singles- pop, country, and R&B- for the time.